Erbil, Kurdistan Region, Iraq (cabinet.gov.krd) – According to the April 2015 report published by the Kurdistan Regional Government, KRG, Ministry of Natural Resources, KRG commitments under the 2015 Federal Budget Law have been met, and oil production has reached record levels. According to an agreement on oil export and budget, reached last December between the KRG and the Federal Government of Iraq, Kurdistan Region is committed to export 550,000 bpd (barrels per day) in return for a budget entitlement close to one billion US dollars per month to be paid by the federal government. The agreement was approved within the framework of the Iraqi Federal Budget Law for 2015. In April, the Kurdistan Regional Government delivered to the Iraqi State Oil Marketing Company, SOMO, a total 16,878,985 barrels for an average of 562,633 bpd. Kurdistan Region oilfields supplied 12,457,371 barrels averaging 415,246 bpd, while North Oil Company (NOC) oilfields, Kirkuk, supplied 4,421,614 barrels averaging 147,387 bpd. Oil from both sources is exported through a KRG pipeline to the Turkish oil export facility at Ceyhan. In March the KRG published cumulative export data, noting that while it met its oil export commitments, the KRG has yet to receive its full entitlement per agreement under the Federal Budget Law of 2015. Last week, in two separate meetings, the Kurdistan Region Prime Minister and a number of members of the Council of Ministers, met Kurdistan Region Baghdad representatives, and the Speaker of the Kurdistan Parliament along with Parliamentary groups. The Prime Minister reaffirmed KRG’s commitment to the December agreement and the Iraqi 2015 Federal Budget Law. He pointed out, however, that if talks with Baghdad do not produce positive results and Baghdad continues its breach of the Federal Budget Law, then the KRG will have to consider other options to stabilise the Region’s financial security. Erbil, Kurdistan Region, Iraq (cabinet.gov.krd) – Kurdistan Region Prime Minister Nechirvan Barzani yesterday received a delegation from the Russian Federation that included President Vladimir Putin’s Envoy to the Middle East and Deputy Foreign Minister Mikhail Bogdanov, Chairman of Gazprom Neft, Alexander Dyukov, and Deputy Energy Minister, Yuri Sentyurin. The delegation highlighted historic relations between Kurdistan and Russia, and their intention to strengthen those relations, particularly in the economic and cultural fields. The Chairman of Gazprom Neft, Mr. Dyukov, briefed Prime Minister Barzani on the activities and progress the company has achieved in the Kurdistan Region, expressing his satisfaction with the level of cooperation his company receives from the Kurdistan Regional Government, KRG, especially the Ministry of Natural Resources. Mr. Dyukov announced that Gazprom Neft plans to raise the volume of his company’s investment in the Region. Prime Minister Barzani expressed to the delegation his appreciation for their visit and for organizing the inauguration ceremony for introducing of the book, “The Nation of Epics: Kurdish Culture in the Eyes of Russian Scholars”, which was compiled and written by scholars from the Russian Institute of Oriental Studies and the Russian Institute of Oriental Manuscripts, and published by Gazprom Neft. He reiterated that cultural relations will lead to strengthening political and economic relations. He expressed his appreciation to the Russian Federation for its readiness to further develop relations with Kurdistan Region. Prime Minister Barzani also discussed the war against the Islamic State terrorist organization, also known as ISIS, and the courage and bravery of Peshmerga forces who counter this threat. He pointed out that due to this brutal conflict the Kurdistan Region endures a heavy economic burden that has been made even more difficult due to inadequate receipt of agreed Budget share from the Iraqi Federal Government. He emphasised this shortfall is occurring at the time when the KRG serving the needs of more than 1.5 million displaced people who fled to the Region seeking refuge from the conflict. The dramatic decline in oil prices has compounded the burden. Prime Minister Barzani expressed his hope that the Russian Federation will assist the Kurdistan Region to effectively pass through this very difficult period. Erbil, Kurdistan Region, Iraq (cabinet.gov.krd) – Kurdistan Region Prime Minister, Nechirvan Barzani, Deputy Prime Minister, Qubad Talabani and a number of Kurdistan Regional Government ministers, yesterday visited Kurdistan Parliament and received by the Speaker, Yousif Mohammad, Deputy Speaker, Jafar Eminki and the Parliament Secretary, Fakhradin Qadir. The KRG delegation held a meeting with the parliamentary groups and relevant committees to discuss the latest developments in the implementation of the agreement, reached last December, between Kurdistan Regional Government, KRG, and the Federal Government of Iraq on budgetary and oil export issues. The parliamentary groups and relevant committees reiterated their support to the Kurdistan Regional Government, stressing that in the event that the Federal Government of Iraq does not abide by the 2015 Budget Law and does not send Kurdistan Region’s budget, the KRG is entitled, according to the Kurdistan Parliament law, to adopt other means to ensure Kurdistan Region’s budget. Following the meeting, both Kurdistan Region Prime Minister, and Kurdistan Parliament Speaker held a press conference and shed light on the topics discussed in the meeting. At the press conference, Kurdistan Parliament Speaker called on the Federal Government of Iraq to abide by its agreement with the Kurdistan Region. Erbil, Kurdistan Region, Iraq (cabinet.gov.krd) – Kurdistan Region Prime Minister, Nechirvan Barzani, yesterday received Dutch Minister of Defence, Jeanne Hennis and her accompanying delegation. Ms. Hennis expressed her satisfaction with the progress of the training of Peshmerga forces by military experts from Netherlands and coalition forces. She stressed on the efficient role played by the Peshmerga forces in protecting Kurdistan territories against terrorism. She said that Netherlands considers the Islamic State terrorist organisation, ISIS, as not only a threat to Kurdistan Region, but to the security of the entire world. She pointed out that her country will continue its support to the Peshmerga forces to help them to eradicate ISIS threat, as it did as part of the coalition forces since the emergence of ISIS threat against the Region. Ms. Hennis also expressed her appreciation to the Kurdistan Region for providing shelters and assistance to a significant number of refugees and displaced people who fled terrorists’ threats and sought safety in Kurdistan Region. Prime Minister Barzani thanked Minister Hennis for her visit and valuable stance towards Kurdistan Region and Peshmerga forces. He expressed the gratitude of Kurdistan people and government to the international community in general, and Netherland’s people and government in particular who since the emergence of ISIS threat have assisted Kurdistan Region. He stated that despite the fact that vast territories of Kurdistan Region have been recaptured and ISIS has started to decline, the terrorist organisation’s threat is far from being eradicated. Therefore, military and humanitarian assistance to Kurdistan Region need to be continued. Prime Minister Barzani expressed his appreciation for the training of Peshmerga forces by Dutch military commanders and experts, hoping that the training programme will continue as it plays significant role in raising Peshmerga forces capabilities in the battlefield. Erbil, Kurdistan Region, Iraq (cabinet.gov.krd) – Kurdistan Region representatives in the Iraqi government and parliament and the Kurdistan Region Presidency of Council of Ministers today met in Erbil to discuss the latest developments in the implementation of the agreement, signed on 2 December 2014, between the Kurdistan Regional Government, KRG, and Iraqi Federal Government. 1. The Kurdistan Region has abided by the terms of the aforementioned agreement and the Iraqi budget law of 2015, as it has exported the amount of oil, stipulated in the agreement. Regrettably, the Iraqi Federal Government, in return, did not abide by its obligations of sending the financial liabilities of Kurdistan Region. This comes as Kurdistan Region endures heavy financial burden due to its 2014 budget being withheld by the Iraqi Federal Government, conducts a fierce struggle against terrorism and accommodates more than one and half million refugees and internally displaced people. The impact of these difficulties on the Region is not being taken into consideration by the Federal Government. 2. The meeting stressed on continuing attempts to solve issues and problems through dialogue with the Federal Government. 3. The Kurdistan Regional Government will abide by the agreement with Baghdad and the Iraqi budget law of 2015. However if dialogue and negotiations with the Iraqi Federal Government do not lead to any result, and if the Federal Government continues to violate the Iraqi budget law of 2015 and withhold Kurdistan Region’s financial liabilities, the KRG will resort to other solutions to ensure the necessary budget for Kurdistan Region. 4. The meeting called on the Iraqi Federal Government to settle the issues between KRG and the Federal Government based on its political programme, and abide by the Federal Constitution and the laws in place. Kurdistan Region President Masoud Barzani met with US President Barack Obama and Vice President Joe Biden at the White House on Tuesday, where they underscored their joint commitment to defeating ISIS. President Barzani thanked President Obama, Vice President Biden, the Administration, Congress and people of America for standing by the people of Kurdistan by making a timely intervention when Kurdistan was attacked by ISIS terrorists. He also thanked them for the continued support to the Peshmerga and the air strikes against ISIS. ‘Thank you for the assistance and support you have provided which has enabled us to liberate territory and protect our people as well as the refugees and displaced people who fled to Kurdistan,’ President Barzani said. He said Kurdistan needs further support to confront the military, economic and humanitarian challenges it faces. ‘I am pleased that the successful coordination between our forces on the ground and yours in the air has meant that no military targets have been missed and no civilians have been hit,’ said President Barzani. He outlined the ongoing humanitarian crisis facing Kurdistan which is sheltering over 1.6million Arabs, Turkmen, Christians, Yezidis and Syrian refugees. President Obama welcomed President Barzani and his delegation and expressed his appreciation for the courage and sacrifices of the Peshmerga and offered his condolences for those who had lost their lives. He and Vice President Biden reiterated their commitment to continuing the fight against ISIS and to providing assistance to the Peshmerga. 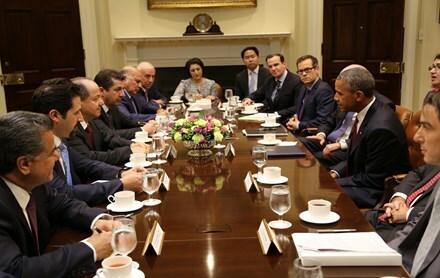 President Obama thanked President Barzani for the refuge Kurdistan has offered to the religious and ethnic minorities that have fled ISIS, saying that it is part of the reason why the international community has respect for the Kurdish people. He also said he had studied Kurdish history and knew the challenges the Kurdish people had faced. The two sides also discussed relations between Erbil and Baghdad and the landmark December agreement which is enacted in Iraq’s Budget Law. President Barzani said the Kurdistan Regional Government is committed to the agreement and expects Baghdad to honour its part also. They spoke about Mosul and the joint effort that would be needed, including by Sunni forces, to retake the city. President Barzani said Erbil, Baghdad, the US and coalition countries were coordinating closely. The leaders also discussed wider regional issues and the future of the region after ISIS has been defeated.